高倍镜示正常乳腺腺泡。注意排成管腔的上皮细胞显示了分泌物进入管腔的顶浆分泌或细胞质分泌。一层肌上皮细胞，部分呈轻微空泡状，正好围绕在腺泡的外围。 At high magnification, the appearance of a normal breast acinus is shown here. Note the epithelial cells lining the lumen demonstrate apocrine secretion with snouting, or cytoplasmic extrusions, into the lumen. 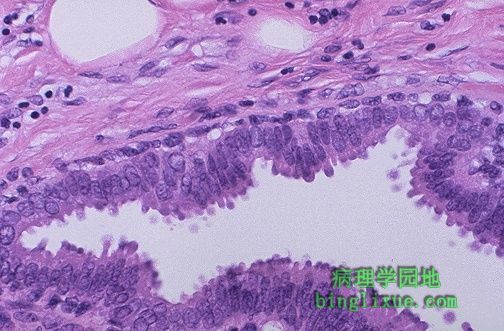 A layer of myoepithelial cells, some of which are slightly vacuolated, is seen just around the outside of the acinus.